The best opening to a Residents show would be for a roadie to come on stage and check various pieces of equipment before standing center stage vibrating and then exploding into red mist through which The Residents emerge and immediately begin playing. To the best of my knowledge…this has not yet occurred. To those unfamiliar, The Residents are an avant garde art collective/band with such a strong underground cult following that they have been able to make whatever boundless peculiarities seemed to please them for 40+ years, mixing musical melody and noise, poetry and screaming, visual arts, film and interactive CD-ROM to create such a rich world that it does in fact make terra firma a litle nervous.. 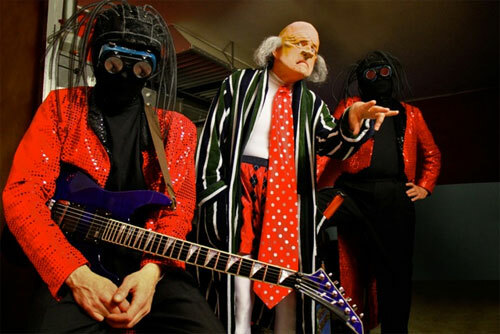 The Residents have such an incredible history and discography, but I am only really familiar with the 90s Freak Show / Gingerbread Man onward, having been introduced via the great retrospective Our Tired, Our Poor, Our Huddled Masses. Their real-life identities and origins fairly obscured, I find a lot of joy in the walkabout internet research that I conduct, rivaled only by the mystery web walks I would undertake every so often to understand, unravel, and infinitely rework the threads of David Lynch‘s Twin Peaks. 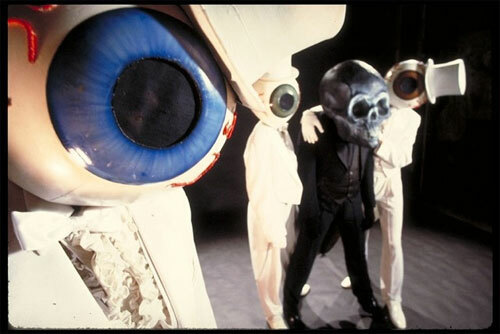 The iconic top-hatted eyeballs of the leading photo were supposed to only be for one album, Eskimo, but their popularity cemented the look as a mainstay for some years as they grew their following. I like to think that they actually started out as top-hatted individuals who simply stood still as their heads were transformed into one giant eyeball that looks to us like a giant monolith-like question mark, but is just a simple period to them. In recent years, however, comfortable with their marketing, they’ve undertaken different characters on stage to further the depth of their black-hole storytelling. The 2002 album Demons Dance Alone is probably my favorite. Following the events of 9/11, most people agree it relates the emotional responses to all that followed, which in itself is interesting, but with their surreal, abstract approach still evident, the album continues strongly through various reinterpretations and wandering thoughts. Along with The Commercial Album, it also provides some of the most purely beautiful/meolodic or easily accessible music that the band has created. The Talking Light concert I saw recently at Highline Ballroom, paled in comparison to the Demons Dance Alone show. 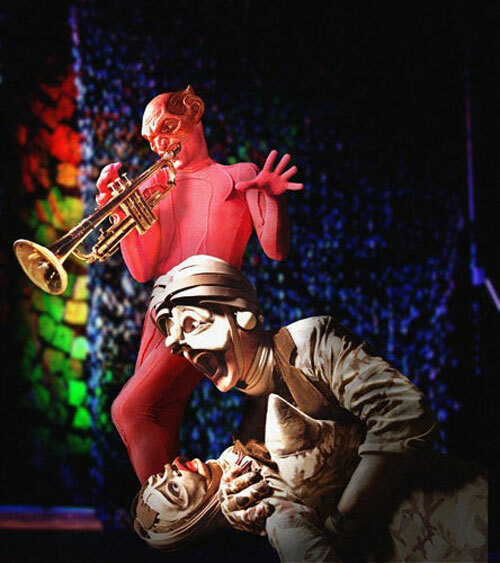 I have not and may not become such a fanatic of their newest storytelling material as I was of Demons Dance Alone. The new show is also scaled back to a three piece band, that still creates an incredible otherworldly theater atmosphere at any venue, but is certainly less dynamic than previous tours. Still, this is possibly only a failure correctable by further listens. I fondly remember initially being turned off by many of my absolute favorite things (The Kids in the Hall, David Byrne‘s David Byrne, Frank Zappa). 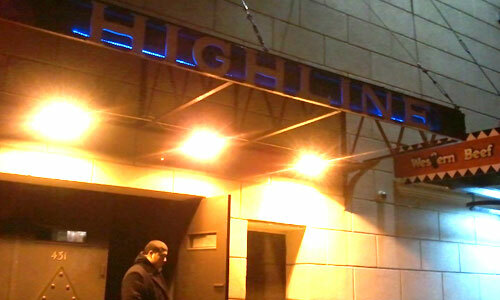 Highline Ballrom, NYC – Home of expensive mini-burgers and wine. If there was any failing on their part, The Residents made up for it with an aftershow at the neighboring Western Beef, where they replaced the flourescents with blacklights and worked the cash registers in such a way as to operate at maximum efficiency while coordinating the sounds of the necessary technology to create an eerie soundbed for lyrics shaping an impossible tale of reanimated beef forced to take a job at Western Beef and sell its familial flesh.